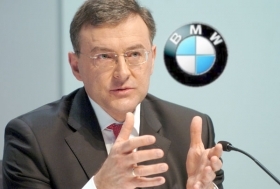 CEO Reithofer wants BMW Group to sell 2 million cars a year by 2020. TURIN – BMW is developing a new family of modular gasoline and diesel engines – including the company's first three-cylinder unit – that will power up to 1.5 million of the automaker's cars a year, CEO Norbert Reithofer said. “(That's) a scale we never had at BMW before,” Reithofer added. To put the volume in perspective, it is more than 200,000 units above the total global sales for BMW Group's three brands last year. The family of three-, four- and six-cylinder engines is primarily for BMW's new front-wheel-drive architecture, but the powerplants also will be used in the automaker's rear-wheel-drive cars, Reithofer told analysts on March 18. The CEO didn't say when BMW expects to reach the 1.5-million-unit-a-year goal for the engines, but the world's largest premium carmaker aims to sell 2 million BMW, Mini and Rolls-Royce cars a year by 2020. In 2009, the BMW Group sold 1,286,310 cars, with small and compact cars accounting for about 400,000 vehicles. Earlier this week, BMW revealed plans to start using a new fwd architecture. Reithofer says the architecture will underpin 700,000 to 1 million cars a year starting in 2014 or 2015. The first car to use the new platform will be the third-generation Mini hatchback, due in 2014. The second model will be a BMW that will be slotted below the brand's entry-premium 1-series line, which will keep its rwd layout. Currently all BMW models are rear-wheel drive, all Mini variants are front-wheel drive and the sister brands do not share any architectures. Reithofer said the BMW brand will offer more than one fwd model, but he declined to share any details “because then Mr. Winterkorn knows it as well,” he said referring to Volkswagen AG CEO Martin Winterkorn. BMW development boss Klaus Draeger said the new architecture will enable BMW to produce a range of vehicles that are between 3800mm and 4300mm long. By comparison, Volkswagen's Fox, Polo, Golf, Beetle and Scirocco model lines fit within the same size range, which covers everything from minicars to subcompacts to compacts. Sources said that at its peak the new architecture will underpin up to 20 different BMW and Mini model variants. BMW needs to meet a growing demand for smaller, more fuel-efficient cars. The company also will have to cope with tougher European CO2 emission rules that start to take effect in 2012. Earlier this week Reithofer said: "We expect the premium small-car segment to grow by 4 percent to 6 percent annually until 2020," adding that the group would cut its CO2 fleet emissions by at least 25 percent by 2020 versus 2008 levels of 156 grams per kilometer. The decision to create a new joint architecture is also a sign of the times. Automakers are under increasing pressure to share investments between brands or with partners to save money. Reithofer said the decision to solely develop a new architecture was the best solution for BMW. “We will have to ask the question: What can we do on our own to create economies of scale? Once we have built our own modular platforms, we can approach others and ask them to participate,” he said. BMW rival Daimler AG is talking with Renault SA about cooperating on small cars to cut costs, pool technology and build scale as the crisis-hit industry tries to become more efficient.